Who Needs Quinoa More Than You Do? A guest at our Thanksgiving Leftovers Dinner raved about a quinoa stuffing she'd made for her own family's annual feast the day before. I cringed a bit because few of us comprehend the dark side of our trendy infatuation with this ancient food from high in the arid Andes. Quinoa is the only plant that's a source of a complete protein; it packs so many nutrients into so little space that NASA called it an ideal food for astronauts. America's upper classes, relentlessly striving to eat themselves into good health, have latched onto quinoa as a "superfood," and are gobbling up tons of it. As a result, you have this gastronomic madness of stuffing an already protein-rich turkey with protein-rich quinoa, when stale bread or bulgur wheat or rice or corn would do just as well -- but with far less collateral damage to the citizens of Bolivia, Ecuador and Peru, where this stuff is grown. Our quinoa craze may be enriching farmers who grow the stuff -- prices, by some estimates, have tripled in recent years -- and they now can afford mechanized farm equipment, solid houses and college education for their children. That's the good news. They send us quinoa, we send them money -- sounds like a perfect example of globalization. The bad news is that this boom is wrecking the diets of indigenous people who actually need to eat it, because they no longer can afford to purchase this life-sustaining vegetable. (We generally think of quinoa as a grain, but it's actually a seed of vegetable related to chard.) Even more ironic, the children of these prosperous growers now can afford junk food, so newly acquired wealth is impacting their diets, too. 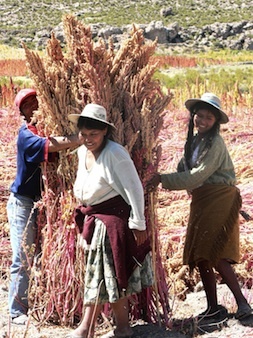 There are reports that quinoa consumption among those who actually live on it is down by about a third in the years since we've "discovered" this 5,000-year-old seed, and that nutritionally at-risk natives of quinoa-growing countries now only can afford cheaper, less nourishing rice or, worse yet, processed food. It starts to sound like right here, where many Americans purchase cheap, nutritionally suspect processed food because they can't afford the real thing. Minuscule quinoa seeds are cooked more or less like rice, and the result can be a substitute for any starchy component of a meal. You can use it as a cereal for breakfast or as a pilaf at dinner; you can make a tabbouleh-like salad for your kid's lunchbox or thicken a soup; you can use it instead of couscous or add it to your chicken curry. Much of it is labeled "organic" or "non-GMO" or "gluten-free" or "fair trade" -- adding a feel-good appeal to Americans who go soft in their legs when they see the word "sustainable" but who may be unaware that they're taking food from the mouths of children elsewhere. What's more, the land used for quinoa crops is fragile and depends upon delicate balance between agriculture and herds of llamas, which help fertilize the area and whose large padded feet prevent erosion. These herds are being reduced to make room for more crops, which suggests that eventually they'll need artificial fertilizer to maintain production, undermining one of quinoa's fundamental market appeals. So what should we do? None of what I've written means we should stop buying quinoa, because then we'd return the Andean farmers to their former states of poverty. Instead, it suggests to me that if we're cooking a meal that might require a nutritional boost -- especially if we're vegetarians or have celiac disease, or if we're outbound in a space capsule -- then quinoa starts to make some gastronomic sense. But if we've already got a wholesome meal in the oven, we don't need to overload it with superfluous "goodness" while removing disproportionate quantities of quinoa from countries where it is needed far more. Perhaps this is a better feel-good approach.